Because of their small size, small fish tanks require a small fish tank filter and a great deal more maintenance than a larger fish tank. This is due to the fact that toxins can build up in a small tank much faster than a larger tank that has a better chance of becoming – and remaining – stable. 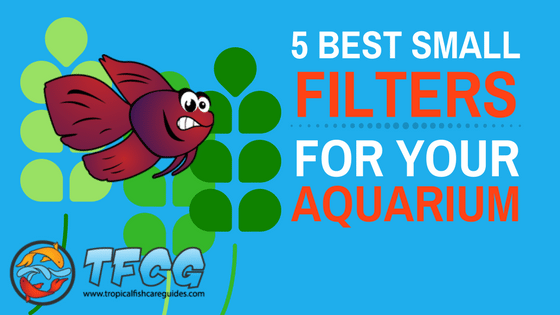 GET a great Small Fish Tank Filter for Your aquarium now. The models listed are great for all aquariums. In some cases, they are also available in smaller and larger capacities. Click the button to Use our FREE comparison tool below to SAVE. GET the Best Small Fish Tank Filter now! What’s Considered a Small Fish Tank? In my opinion, small fish tanks are anything under 20 gallons. Anything under 5 gallons would be a nano tank, but for the purpose of this article, I won’t distinguish between the two. With that in mind, when talking about small fish tanks, filtration becomes a major challenge and the smaller the tank, the more important filtration becomes. Which is why you need a small fish tank filter that can fit in a tank 10 gallons or less but still provides you with top quality filtration to ensure your tank remains healthy and clean. 5 Small Fish Tank Filter Kits. If you are looking for a kit that comes with a filter most starter kits come with everything included are fairly cheap and easy to set up. A word of caution when purchasing a kit! The filters provided typically are just enough filtration for the tank. As a general rule, I typically like to use a filter that is rated for a slightly larger tank than the tank I have. If I have a 10 gallon tank I would prefer a filter rated for 20 gallons. This ensures the filter can handle the tank and provide a little more filtration. The more filtration the better! In our opinion, the best filter for a small fish tank would be the Aqueon QuietFlow 10 Power Filter. 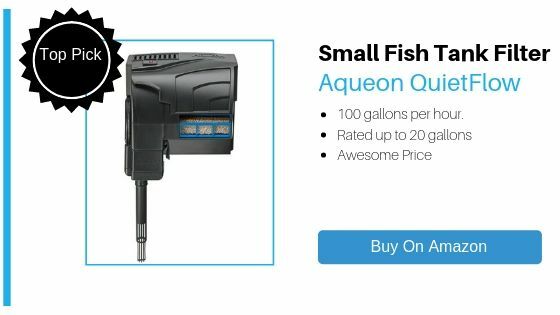 The Aqueon QuietFlow 10 Power Filter is rated up to 20 gallons and can filter 100 gallons per hour. In other words, it will change the water in a 20-gallon tank four times every hour, which is ideal. This filter would be a great 10-gallon fish tank filter and would keep the water crystal clear and well filtered.